Penny wanted to wear her hair “down” like all of the other girls in her class. She wondered why her friends had long straight hair and she did not. Feeling different made her feel sad. Penny’s mom assured her that her hair is perfect. Just because her hair is different from her friends hair, it didn’t mean that it was bad. Penny’s mom decides to style her hair in puffballs, magic puffballs. Penny learns though a series of fun adventures, that wonderful and magical things happen when she wears her puffballs. 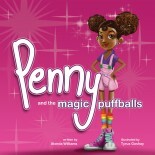 Join Penny as she discovers the magic of her puffballs.